Analyzing the changes wrought by the railroad, William Deverell reveals the contradictory roles that technology and industrial capitalism played in the lives of Americans. That contrast was especially apparent in California, where the gigantic corporate "Octopus"—the Southern Pacific Railroad—held near-monopoly status. The state's largest employer and biggest corporation, the S.P. was a key provider of jobs and transportation—and wielder of tremendous political and financial clout. Deverell's lively study is peopled by a rich and disparate cast: railroad barons, newspaper editors, novelists, union activists, feminists, farmers, and the railroad workers themselves. Together, their lives reflect the many tensions—political, social, and economic—that accompanied the industrial transition of turn-of-the-century America. 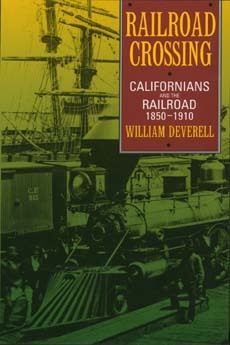 William Deverell is Professor of History at the University of Southern California and Director of the Huntington-USC Institute on California and the West. He is the coeditor of California Progressivism Revisited (California, 1994) and coeditor of Metropolis in the Making: Los Angeles in the 1920s (California, 2001).